The existing standing seam metal roof at the Federal Aviation Administration’s Aeronautical Center in Oklahoma City was leaking and repeated attempts to fix the leaks had failed. Years of chasing leaks would finally come to an end when the FAA’s architect recommended this building at the Mike Monroney Aeronautical Center in Oklahoma be restored with the TRITOflex fluid-applied roof system. Based on other successful projects completed on numerous FAA facilities with TRITOflex in Oklahoma and Alaska, it was an easy decision. Tearing off the entire roof and replacing it would not only be expensive, but very disruptive . Recovering the metal with a mechanically-attached single-ply membrane was an option, but drilling thousands of fasteners into the old metal deck concerned the FAA’s engineers. Converting a standing seam roof into a metal roof also changes the weight distribution when heavy rains occur, adding to structural concerns. Another fluid-applied system could have been selected at a cheaper cost, but drastically differing performance. Acrylic coatings are permeable and will continue to allow oxidation and rusting of the metal. They also will not withstanding ponding water and have very poor tensile strength, requiring the use of fabric reinforcement. A silicone coating was also considered because they withstand ponding water. However, silicones have very poor resistance to hail and are prone to splits and zippering tears. Freeze-thaw cycles tend to damage silicones and they can only be repaired with silicone products, as nothing will ever adhere to silicone once it is applied. So the architect made the smart choice of specifying a spray application of TRITOflex seamless rubber directly over top of the existing metal at 80 mils dry (2 mm), creating a monolithic waterproofing membrane over the entire roof. TRITOflex is water-based, contains no VOC’s, and is easily repaired if damaged. With extremely high elongation and high tensile strength without reinforcement it outperforms all other liquid roofing markets on the market. It will withstand ponding water indefinitely as an impermeable membrane and the only preparation needed was a simple pressure wash. The FAA’s new roof investment was installed quickly and without disruption. They received a 20-year material and labor warranty, backed by 35 years of roofing experience and 50 years of expertise in rubber chemistry. 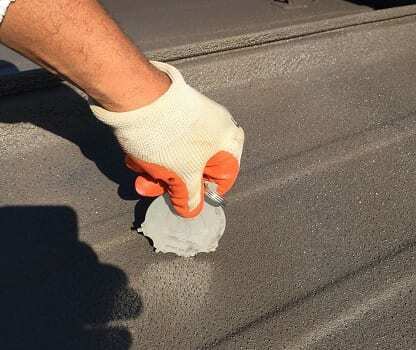 The Certified Triton Applicator completed the system with the TRITOtherm ceramic top coat for additional energy efficiency, even when the roof becomes dirty over time. The F.A.A. 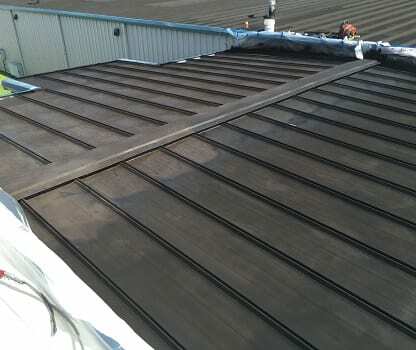 made the right decision to invest in a watertight, flexible, and durable monolithic membrane that will withstand hail, extreme winds, freeze-thaw cycles, and expansion/contraction of the old metal roof.